Soror Renee’ L. Bourgeois was born & raised in Louisiana in the small town of Franklin south of Lafayette. She attended Louisiana State University in the fall of 1981 where she earned a Bachelor of Science degree in Merchandising. She also earned a Master’s Degree in Organizational Management from the University of Phoenix. Renee’ has been employed at the LSU Museum of Art for 13+ years and is currently the Events & Marketing of Facility Rentals Coordinator. She is a Founding Member of the Baton Rouge Events Association, board member of Baton Rouge Women In Media & member of Baton Rouge Sales & Marketing Executives. Soror Bourgeois was initiated into Rho Epsilon Chapter on the campus of Louisiana State University (LSU) in the fall of 1982. As an undergraduate she held several elected positions including Basileus. After graduating from LSU she moved to Houston for three years where she was a member of Lambda Zeta Chapter. She returned to Baton Rouge in 1993 and joined the newly chartered Omicron Sigma Zeta Chapter where she currently holds membership. She served 6 years as Basileus and 8 years as Tamias as well as chair of several committees. Soror Bourgeois was instrumental in the opening of her chapter’s Stork’s Nest. She has held 4 elected Regional offices, appointed the Regional Director of Protocol & served in other appointed positions. She has also held several appointed positions on the National level. She is a Life Member of Zeta Phi Beta Sorority, Inc. (1996), a Charter Member of the Southern Regional Legacy Club & the National Legacy Club. She is the cousin of the 12th International Grand Basileus Lullelia Walker Harrison and has a Zeta sister, Soror Valerie Bourgeois. She is MIP, Amicae, and ZOL (Regional Train the Trainer) Certified. She is a member of St. John the Evangelists Catholic Church and is active in the church ministry & a school volunteer where her niece is in the second grade. She also volunteers in her community through her chapter and professional organizations. Soror Bourgeois has been a financial and active member of Zeta Phi Beta Sorority, Inc. for almost 36 years. 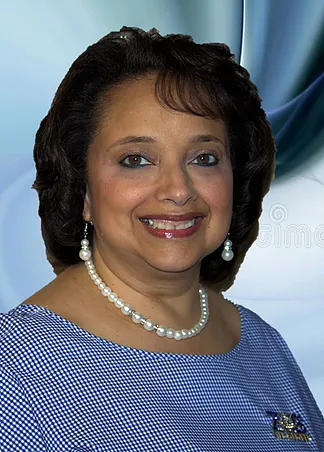 She credits her Zeta Mentor, the 21st International Grand Basileus, the Honorable Barbara West Carpenter for taking her under her wing in the early years of membership and setting her on the path to service for the sisterhood. Her motto, “God first, family and the LOVE of Zeta Phi Beta Sorority, Inc.” She shares the royal blue & white with the love of her life, a member of Phi Beta Sigma Fraternity, Inc.